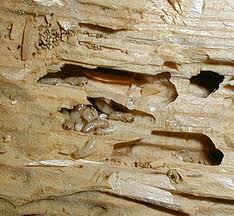 If subterranean termites discover your home, they will search it for the wood fiber. They can squeeze through cracks as narrow as the thickness of a penny. Expansion joints, foundation cracks, tiny gaps around plumbing and electrical service entries are all opportunities for termites. Termites will often leave some evidence of their presence. In Oklahoma, the main termite that we deal with is called the subterranean termite. This means that they live in the soil, and they feed on wood as stated above. They originally lived in the sandy soil of river beds, and fed on the drift wood in those beds. Now, since the river sand is transported to home building sites, the termites and their eggs are placed right in to the soil below the concrete slab. When houses are built, they are supposed to be treated for termites by spraying the soil, the problem is, that most treatments are done cheaply with inexpensive materials and don’t last very long. When our Professional service comes to your home to inspect, we will look for small holes in wood and sheetrock, crumbling surface on drywall, and sagging doors or floors. There might be mud or dirt blobs on the surface of wood or drywall, these are signs of shelter tubes that termites travel through. Another sign of termites are insect wings that are shed when they swarm. Countryside Pest uses Termidor exclusively for termite control. If your going to do a job, why not use the best tools you can get, that’s why we use Termidor. Its action works like a bacterial virus, once they are exposed to it, they spread among them and it wipes them out. We give an initial warranty with our work, and make it renewable every year after that. 2. Works with the transfer effect (like a bacterial virus) and spreads to the entire population wiping them out. 3. Starts working immediately and termite activity stops usually after 30 days. 4. The world’s most effective termiticide --- over 12 years of test data proves unparalleled effectiveness. 5. Responsible, low dose treatment, with no odor, environmentally safe. 6. Only pest professionals, who have been Termidor-Certified, can apply Termidor. For a FREE inspection for your home or business, give us a call, ask for Byron 405-923-0812 If subterranean termites discover your home, they will search it for the wood fiber. They can squeeze through cracks as narrow as the thickness of a penny. Expansion joints, foundation cracks, tiny gaps around plumbing and electrical service entries are all opportunities for termites. Termites will often leave some evidence of their presence. In Oklahoma, the main termite that we deal with is called the subterranean termite. This means that they live in the soil, and they feed on wood as stated above. They originally lived in the sandy soil of river beds, and fed on the drift wood in those beds. Now, since the river sand is transported to home building sites, the termites and their eggs are placed right in to the soil below the concrete slab. When houses are built, they are supposed to be treated for termites by spraying the soil, the problem is, that most treatments are done cheaply with inexpensive materials and don’t last very long.